How blessed we are! And how grateful we are to our God for the growing family He has given to us. We’ve just returned to Haiti from 3 weeks in the states where we so enjoyed our family, including the two newest grandbabies – Olivia Lee born on Jan. 19 to Allison and Pat, and Cutter Glenn born on Feb. 16 to Erika and Travis. Both babies and mothers are doing well. Praise the Lord! Give thanks to the Lord, for he is good; his love endures forever. (Psalm 106:1) Our total number of grandchildren now stands at nine… how blessed we are! As we “count our innumerable blessings”, we must conclude by stating that our greatest blessing by far is our own adoption into God’s family forever. To be recipients of His righteousness at our Savior’s expense is a glorious truth at which we continually marvel. To Him we give our greatest praise! You alone, Lord Jesus, are our supreme blessing! In one of this week’s devotional readings from Morning by Morning by Charles H. Spurgeon, I found one of my favorite thoughts. 1 Samuel 7:12 says, “Then Samuel took a stone and set it between Mizpah and Shen, and named it Ebenezer, saying “Thus far the LORD has helped us.” I love this, not only because I live in a stone house that the Mission has named “Ebenezer”, but because Dennis and I can say with all assurance and sincerity that “thus far the LORD has helped us”. Believers and followers of Jesus Christ have this assurance of what is to come. On this last day of 2017, consider your relationship with Him. What do you see when you look back? Where is your hope as you look forward? 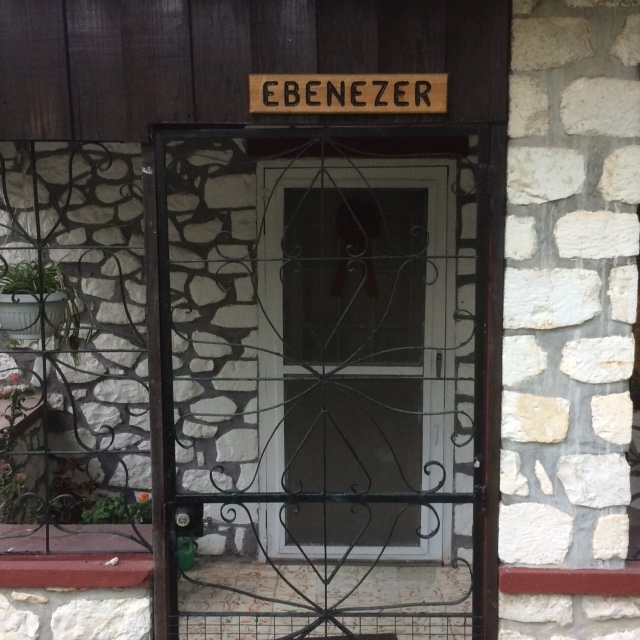 With grateful confidence we raise our Ebenzer! We’re preparing for a hurricane. We’ve been in Haiti for two other hurricanes, but this one is bigger and has greater potential for devastation to this very poor island nation. We do not fear for ourselves. We are in sturdy buildings on time-tested mountainsides. We have enough food and water. Currently, we have electricity, internet, and phone service. Our lack of fear does not come from these factors, however. Anything tragic can happen at anytime – to anyone – anywhere. It just seems like a good time to reassure our friends and family that we know our lives are in the powerful Hands of our God. He has always been in control of our lives, but our assurance came the moment we realized that we are flawed and sinful people and placed our trust in our Savior Jesus Christ for life on this earth and the forever life to come. So we are ready. Ready for Hurricane Matthew. Ready for the next thing God has for us. Ready for many years on this planet, or only our next breath. Please continue to pray with us. Pray for the country of Haiti and its people – many of whom cannot say they have the assurance we have. Pray that they would turn to Jesus in repentance and faith in Him alone who can offer the way, the truth, and eternal life – before it’s too late. 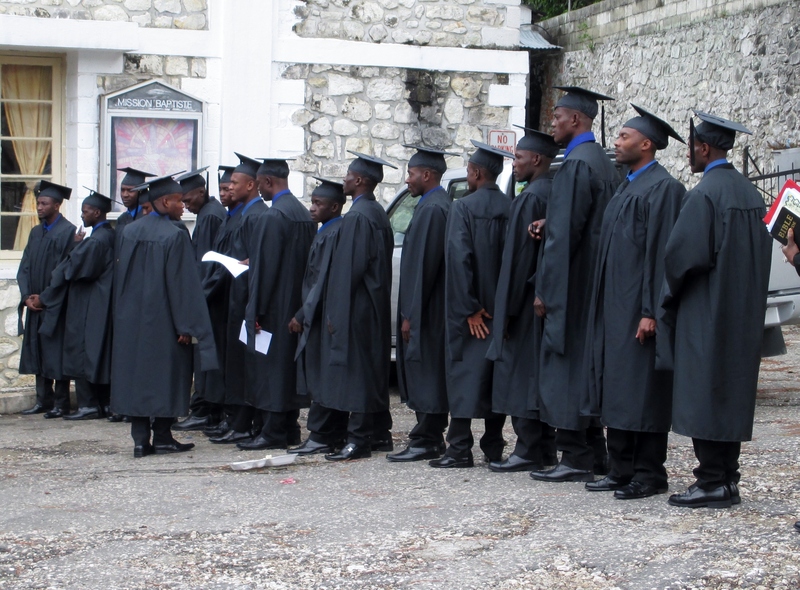 August 29th was a very special day for 17 young men who became the newest graduating class of Baptist Haiti Mission’s Summer Bible Institute. For 2 months each summer for the past 4 years, these men left their homes and families to live on the BHM campus and devote themselves to classes and intense study. Family members, friends, pastors, special guests, missionaries, and fellow classmates in their first, second, and third years were witnesses to this solemn yet joyous ceremony. Most of the graduates had finished high school but had no further education for various reasons. But they had a desire for more and deeper biblical education. BHM established this worthy program many years ago to help the leaders and others in their churches and schools across Haiti to gain solid Biblical training. Why We’re Here… This Is It! We finished our Association of Churches’ annual National Conference this past Sunday with a beautiful morning service that was broadcast via radio throughout the country. This service closed what many thought was one of the best conferences for many years. The conference was very applicable to where our churches are. Former Field Director, Pastor Rob Baker had the opportunity to begin the conference by teaching on sound doctrine. Other topics taught by various pastors and leaders included institutional development, wise management of resources, entrepreneurship for leaders, use and dangers of technology, Christian education, effective leadership, structure of the church, and the family from a Biblical perspective. Some of the conference speakers were graduates who had come up through this ministry through the churches. All of the topics pointed toward having a stronger church and stronger individuals with good testimonies in order to spread the true Gospel throughout Haiti and the rest of the world. Talking about their responsibility as leaders was also a resounding theme. It was a great time of fellowship and encouragement. Growing maturity with the ASEBACH executive committee was also seen as they functioned together much more like a team. It was great to see the body of Christ working together for His glory and honor. We thank God for the very uplifting week we had. 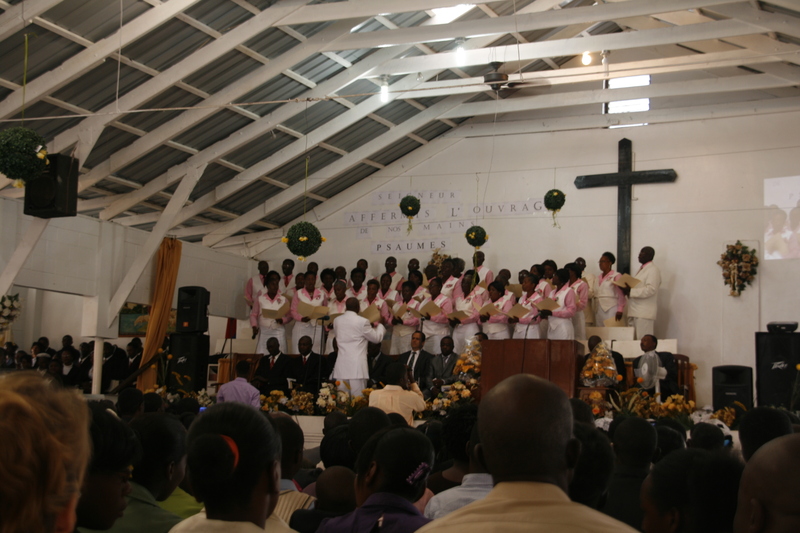 Through various kinds of education, medical care, child sponsorships, and economic-oriented ministries, we are here to advance the Kingdom of God through the churches of Haiti. We are here to magnify and glorify the Name of Jesus so that all might see and come to Him as personal Lord and Savior. May God be praised! This is significant to me. 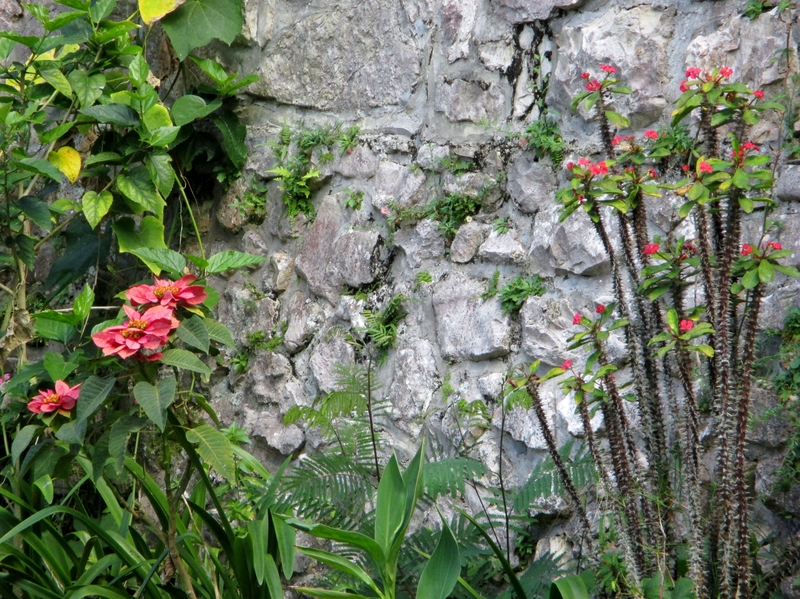 I was interested in photographing a poinsettia growing outside behind our apartment here in Haiti. Then I stepped back and included in one of the photos the ‘Crown of Thorns’ plant growing close to it. Anybody know where I’m going with this? The poinsettia is a much-loved and beautiful traditional Christmas plant for well over 100 years; one of the few plants anyone in Indiana will buy in December. Christmas is the celebration of the birth of Jesus Christ. The One sent to the earth by God to be born fully man, yet fully God. He was born so that one day, he would wear a crown of thorns, be crucified, and then triumph over sin and death by rising from the dead. Having these two plants growing so close together in our backyard is a thrilling reminder of the reason we celebrate Christmas.